Finished in a sleek Satin Silver this stunning low mileage CT Sport combines style with comfort and superb economy offering very little running costs and costing you absolutely nothing in road tax. 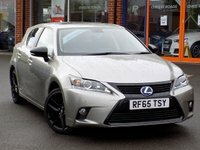 Comes very well equipped with excellent features including, Satellite Navigation, Electric Sunroof, Bluetooth, Cruise Control, Half Leather Upholstery with Heated Front Seats, DAB Radio and Dual Zone Air Conditioning. Please ask for details of our fantastic finance and warranty packages, subject to status, T's and C's apply.